• mediation of intellectual property disputes. Types of dispute covered includes allegations of infringement of intellectual property rights such as patents, trade marks, copyright and confidential information, validity challenges to registered rights in the context of intellectual property arbitration, disputes as to ownership, and, as to licences of intellectual property rights, whether a particular activity falls within the scope of a licence, issues stemming from technology transfer and its ‘know-how’ element, the definition of licensed rights and of licensed products, calculation of royalties, and much more. Intellectual property practitioners advising on or participating in international intellectual property arbitration will warmly welcome this practical, systematic treatment. The clear analysis and presentation will also provide the arbitration specialist who lacks familiarity with intellectual property with valuable insights into the perspectives of intellectual property practitioners and the specificities of intellectual property in the context of arbitration. 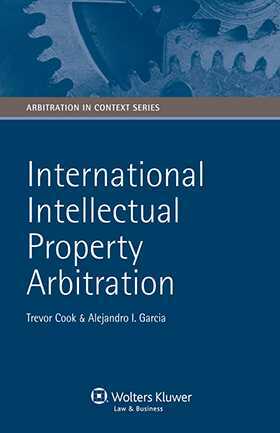 In a more academic or policy context, the book is sure to contribute to the development of arbitration as a way of resolving intellectual property disputes, especially on a multijurisdictional basis. List of Abbreviations. Preface. Chapter 1 Introduction. Chapter 2 Intellectual Property, Agreements Relating to It and Disputes that Arise as to It or under Such Agreements. Chapter 3 Benefits and Limitations of International Arbitration for IP Disputes. Chapter 4 Arbitrability of IP Disputes. Chapter 5 Legal and Regulatory Framework of an IP Arbitration. Chapter 6 Arbitration Agreements. Chapter 7 The Arbitral Tribunal. Chapter 8 Organization and Conduct of Arbitral Proceedings and the Taking of Evidence. Chapter 9 Confidentiality of Arbitral Proceedings. Chapter 10 The Making, Setting Aside, Recognition and Enforcement of Arbitral Awards. Chapter 11 IP Mediation. Appendix 1 Convention on the Recognition and Enforcement of Foreign Arbitral Awards (New York Convention), 1958. Appendix 2 WIPO Arbitration Rules, 2002. Appendix 3 WIPO Expedited Arbitration Rules, 2002. Appendix 4 WIPO Mediation Rules, 2002. Index.